A road trip across the West in 1980 turned up lots of memorable motel doors, among many other finds. Shadows from the most ubiquitous of window coverings, Venetian blinds, imprint themselves into my favorite photographs. Does your preference for distorted reflections indicate something about your personality? Maybe. Sometimes I prefer my reflections to be crystal clear, sometimes not. Today they’re mirror images. Compare an image in black and white with its color counterpart. How do your impressions differ? 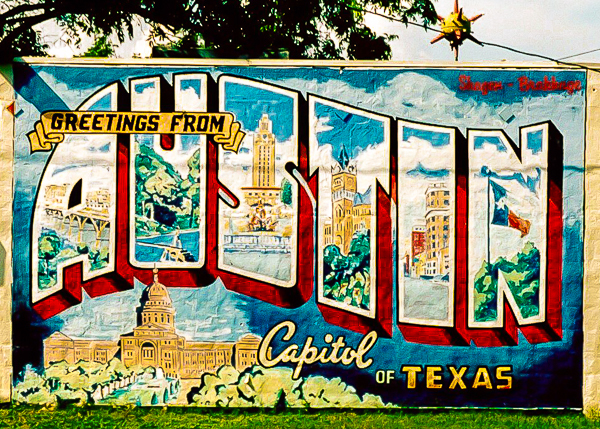 Take a quick, self-administered test to see how your perspective on Austin stacks up. Ahhh, the delights of discovering your dream coffee is also a work of art. The dawn light yields some ethereal images in the Mexico Baja.